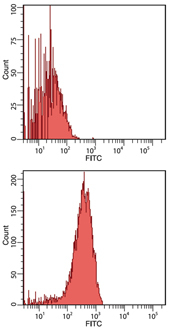 Immunogen: Purified HSC70 (Hsp73) and HSP70 (Hsp72) isolated from human HeLa cells. 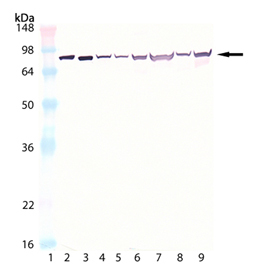 Application Notes: Detects a band of ~72-73kDa by Western blot. Lane 9: PC-12 (heat shocked). Flow cytometry analysis of human colon cancer Caco2 cells analyzed by flow cytometry using isotype control. Immunohistochemistry analysis of human spleen tissue stained with HSC70/HSP70, mAb (N27F3-4) at 10µg/ml.